how to put out the fire? so far i have an axt,a bottle, a carot and a rope, need water! And a pink balloon where is used bottle and rope on. balloon is in front of the trunk from the cut tree. balloon + ropes...but i can't tie the turtle? a bucket...great for to put water!! where you found it? missed the bucket...where is it? Found a bucket, filled it from the pond in the first screen and put out the fire. Found it, after this you can connect balloon to the turtle. Can't find balloon either. Clicked all over felled tree. out...cute game...thanks for the help!! maybe each game got his own numbers? This is possible alkmar (different numbers) but i won´t start again, waiting for the next one lol. Got the bad end :o( but thanks for all the tips! Will come back later and try to get the turtle to win - he's cute! The moral of the story: Slow and steady doesn't win the race...CHEATING does! You are the tortoise and need to beat that darn rabbit in the race! Note the raging fire you need to put out! Go left and you see another gap, but there’s no tree to help you cross this time! Go left again (ignore the code box) and get the bad ending -- you lose! Go left 2 times and win the race! cute game! easy but likeable. 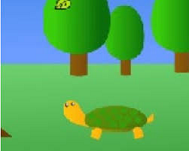 Short and cute game (unless the cheating of the tortoise)! Thanks @Zazie for the balloon, and thanks @kitkatfox for the walkthrough!